Infineon Technologies AG and XMOS Ltd. partner to deliver a new building block for voice recognition. It features a combination of radar and silicon microphone sensors from Infineon and audio processor from XMOS. The devices provide far field voice capture by audio beamforming combined with radar target presence detection. Together, they guarantee for optimal sound recognition and flawless execution for digital voice assistance across a broad range of voice-controlled devices. Target applications are especially smart home as well as smart TV and set top box, secure keyless entry systems, and other voice-operated consumer devices. The performance of current MEMS microphone limits the effectiveness of systems: when multiple persons are speaking, the veracity and location of the voice source cannot be precisely identified and separated from inanimate object noise. Infineon’s 60 GHz 2Tx/4Rx radar IC with accompanying antenna and the 70dB SNR microphone helps to overcome these impediments. The microphones are based on the dual backplate MEMS technology from Infineon and are well suited for far field voice capturing and beamforming. In addition, improving the SNR of the microphone will further enhance the performance. 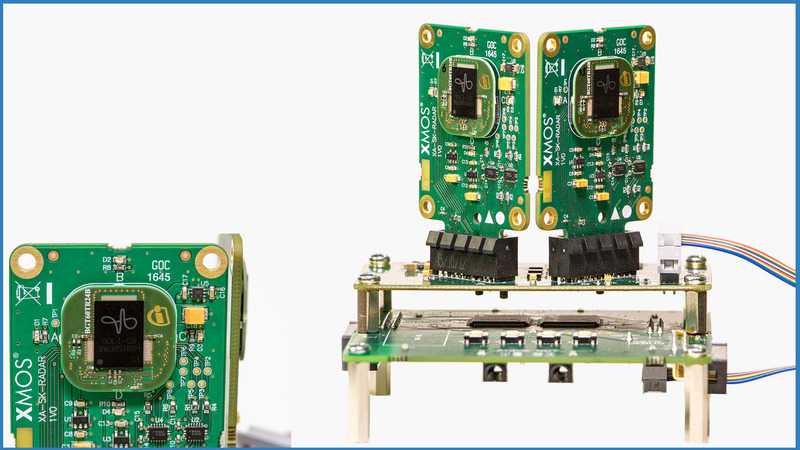 The XMOS audio processor analyses the signal data from an array of Infineon’s digital microphones, adjusting the angular and distance data from each microphone to produce a beam at an angle identified by the radar data. A lit LED indicates presence detection and where sound is taken from.